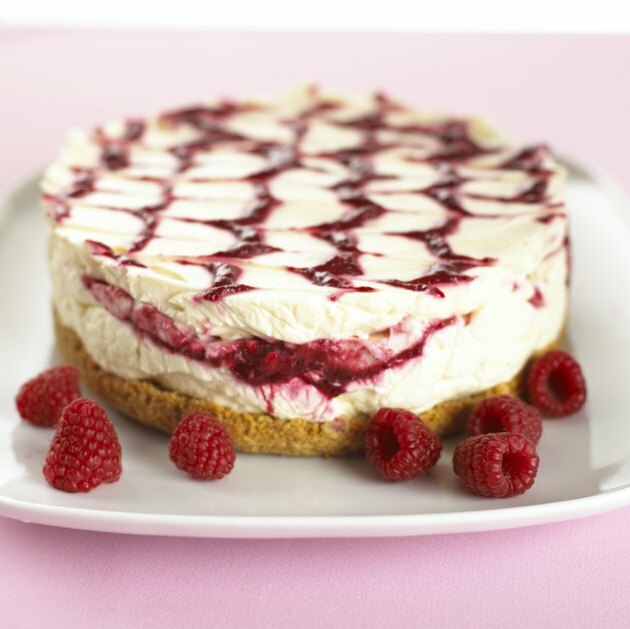 Can You Use Mascarpone Instead of Cream Cheese in a Cheesecake? Cheesecakes are among the richest of all desserts, so potent that even the smallest of slices can be considered a substantial portion. Most are topped with fruit, to provide a tart foil for the richness of the cake, but this is by no means universal. In America, cheesecakes are usually made with cream cheese, but other fresh cheeses including mascarpone are common in their respective homelands. Cheesecakes have their origin in the days when meat was a less common choice for daily meals, either because of scarcity or reasons of religious observance. On meatless days, a rich mixture of eggs and cheese made a hearty and satisfying meal that was both cheap and high in protein. They were made from a variety of fresh cheeses, including mascarpone and ricotta in Italy, quark in Germany and Holland, and various types of cottage cheese elsewhere. In America, cream cheese became the common choice, because of its consistent texture and wide availability. Mascarpone is a rich, soft cheese that originates in the Lombardy region of Italy. It is made by boiling cream until it's reduced and then adding an acidic ingredient, usually cream of tartar, which causes the cream to thicken and ripen. This places mascarpone in a middle ground between sour cream and the true cheeses. A similar cheese, called labneh, is made in the Middle East by draining yogurt until it is thick. Mascarpone cheesecakes in general have a slightly softer texture than those made with cream cheese. The two are not directly interchangeable, so don't use your usual cheesecake recipe. You're better off finding a recipe calling for mascarpone, which as an ingredient, has already been adapted to the cheese's different texture and moisture content. You will find those in some Italian cookbooks and on reputable Internet recipe sites. Tiramisu, the popular Italian dessert, is essentially a type of mascarpone cheesecake. Mascarpone is expensive, so sometimes it's worthwhile to make your own. First you will need to dissolve an ounce of cream of tartar, available in your supermarket's baking section, into one fluid ounce of boiling water. Cool the solution, and keep it in a small sealed bottle. Simmer two quarts of heavy cream until it is reduced by 1/3, then cool it quickly by moving the pan to a bowl of ice water and stirring constantly. Once it is cold, stir in a teaspoon of your acid solution, and reheat the mixture to 118 F. Drain overnight in a cheesecloth bag, until thick.